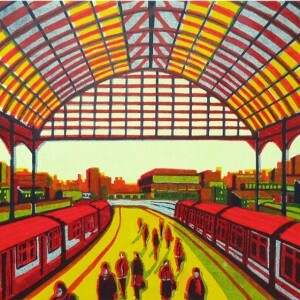 Gail Brodholt is a leading linocut printmaker of contemporary urban landscapes. Using rich colours, she displays an expert eye for composition, draughtsmanship and colour. Gail was born in South London to immigrant parents, her father Norwegian and her mother from Trinidad. Her work is concerned with journeys, both actual and temporal, providing an outsider’s narrative on present day London which is tinged with certain nostalgia for the railways and tube trains.